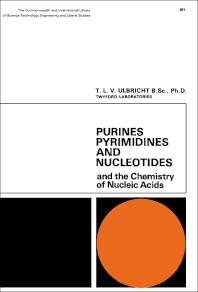 Purines, Pyrimidines and Nucleotides and the Chemistry of Nucleic Acids serves as an introduction to the basic chemistry of purines and pyrimidines and their derivatives. The textbook focuses on topics that provide information on the nature and properties of purines and pyrimidines and nucleic acid. Chapters are devoted to topics on the general chemistry of purines and pyrimidines; synthesis of purines and pyrimidines; and the structure, synthesis, and mechanism of nucleosides, nucleotides, and nucleic acids. Biochemists, chemists, molecular biologists, and senior undergraduates taking courses in heterocyclic and natural products chemistry will find the book very useful.